Behavioural challenges can pop up from time to time in our children and this is to be expected. But sometimes, even when we read behaviour as communication, are aware of our child’s unique sensory processing profile, are attuned to our child, follow their lead, and have a great relationship, our children can still surprise us with inappropriate behaviour that can be harmful to themselves or others. What is going on? What do we do? Our latest challenges involve behaviour at school. Using a developmental approach, I am understanding and caring about what is going on, using all of the strategies and techniques available to me from my training towards my Advanced Floortime Certificate and through experience consulting with and alongside many DIR Expert Training Leaders. I was still left wondering, though, what more I could be doing rather than waiting on my child’s development and readiness. I asked my colleague, DIR Expert Training Leader, Jackie Bartell about the situation, and she offered some great suggestions. Jackie is a retired special educator who has been practicing Floortime in a school setting for about twenty-five years. Her knowledge and experience is greatly appreciated so I wanted to share what we discussed here today. The Situation For many months now, on many days upon arrival at school, our son is so incredibly excited to see his one friend that he will run at full speed up to this friend, startling him and those around him, and tickle him while yelling “Tickle! Tickle! Tickle!” causing the already dysregulated friend, who is having a hard time transitioning to his own arrival at school, to become further upset and cower away from my son. He will be visible unhappy at what my son is doing. A Developmental Approach Using a developmental approach, we understand that our son is doing this for a reason, so we are not going to punish the behaviour or try to reason with him. We are not going to scold him nor ‘teach him a lesson’ nor tell him to ‘stop it’. All of these behavioural actions are not only developmentally inappropriate, but they ignore our child’s intentions and communication. They also ignore that our child, although capable of ideal behaviour under many circumstances, might struggle to organize himself when so much is happening and his nervous system gets too upregulated. We have to understand that our children’s developmental level might be suggestive of not knowing a different way to communicate or play. This could also be due to motor planning and sequencing challenges. Just like we wouldn’t scold, punish, or expect a baby to ‘behave’ if (s)he playfully smacked us in the face, we see our child through the lens of developmental difference and guide and support them instead. What is a more socially acceptable way to say hi to our friend and express how excited we are to see him? The Why Our son is super excited to see his friend and this is his way of communicating and sharing that excitement. But something else is contributing to why this is happening. This is a transition from home to school, and away from Mama to his friends and school staff. This is likely making him dysregulated on some level and moving organizes him. This is part of his sensory profile. Running gives him some regulation as he races towards his friend. Once we think and socially problem-solve some ideas of how he can say hello to his friend, we can prepare just before we go into school to let him know the expectation of him, or what to do, which is different than what he can do which we discussed a moment ago because it can be dysregulating and disorganizing for him to hear a big list of all the possible things to do. In the moment if he doesn’t do what was discussed, we can use less language in the moment (since he is hyperaroused and will not be processing the language) and just guide him away from his friend, rather than discuss what happened. When I get to school Mama drops me off and gives me a kiss. I will remember that I can use words to say hello to my friends. My teachers will be very happy when I remember to use words to say hello to my friends. I will be very proud because I remembered to use words to say hi to my friends. When he continues to run and tickle his friend for a few days, we won’t get upset because we know that this can take some time. Have something heavier in his hands or wearing a heavy backpack could be a proactive way to not only give him proprioceptive input to help his regulation, but could also keep him focused on what he is carrying. Perhaps also working with him on different ways of entering school, like walking backwards together could turn this into an opportunity rather than a challenge. The Situation In the last few weeks at school pick-up, our son has started playfully kicking his teacher as we say good-bye and exclaiming “Aoww!” as he looks to her for her reaction. I say “playfully” because he is not reacting out of defense nor being aggressive. He is clearly initiating the behaviour, looking for a response. The Why Our son’s playful kicking is another example of his cause-and-effect play, this time in the social realm. He is clearly looking for the reaction of his teacher, but why is he using kicking? This is where we can dig deeper to find an answer. Two things came to mind: one from me, and one from Dada. Hunger: Dada asked if our son had eaten all of his lunch on days when he’s dysregulated enough to start kicking at school pick-up. Sure enough, Dad was right. Our son had not eaten all of his lunch and was likely really hungry by the end of the day. We know that when our son is hungry, he tends to act out. The next question would be to find out why he wasn’t eating his entire lunch. Jackie suggests that there could be many reasons. Perhaps something happened at lunchtime, like witnessing another child’s meltdown, that could have distracted the children from eating their lunches by affecting their regulation. If this were the case, the staff would need to slow down to support regulation in order to ensure that hunger is taken care of for all of the children. I suggested that since our son likes to pick out his favourites, the staff might need to support him eating his lunch to ensure he’s eating his pasta together with his sausage, for instance, rather than just picking out all the pieces of sausage. He will eat both at home with assistance. Habit: I know that our son has used this kicking behaviour with his father at home when he has had enough or is very tired. Jackie pointed out that if he tried this ‘experiment’ with Dada once and he got a really interesting reaction out of his Dad, he is eager now to try it again and here he might be trying it out with someone else he has a good relationship with, his teacher. Prior to my arrival at school pick-up, his teacher can say, “Mama’s coming to pick you up. You will say “bye” by waving then you will go to the car with Mama and go home for dinner and I’ll see you tomorrow.” so that he has a clear expectation of what to do, rather than what not to do, as above. In the moment if he doesn’t do what was discussed, we can use less language in the moment (since he is hyperaroused and will not be processing the language) and just guide him away from his teacher, rather than discuss what happened. At home or at school we can create a social story he can look at that talks about what happens when school is done and Mama comes to pick him up at the end of the day. Dr. Stanley Greenspan who created the DIR model, suggested that having more daily Floortime sessions will provide your child with more opportunities to connect with you and problem-solve. By increasing the amount of quality time you spend with your child in Floortime, you improve the child’s connection with you and you are showing empathy to your child so your child can, in turn, develop their own empathy. Using Floortime to supplement how we set limits and lay out expectations is a way to help your child develop and mature with empathy and respect for others. In Floortime, our son is working in the fourth Functional Emotional Developmental Capacity (FEDC) where he is entering the realm of symbolic play. We have a great opportunity to enact going to school, and leaving school, with characters he likes. Here we can set the situation up for him to see where he takes it. Since our son plays with trains everyday and is beginning to voice the role of different train characters, I could race over to startle one of the trains and ‘tickle’ the train. My son might then do the same back, thinking it’s great fun, but when he does, I could react negatively saying that I don’t like that and that he startled me. 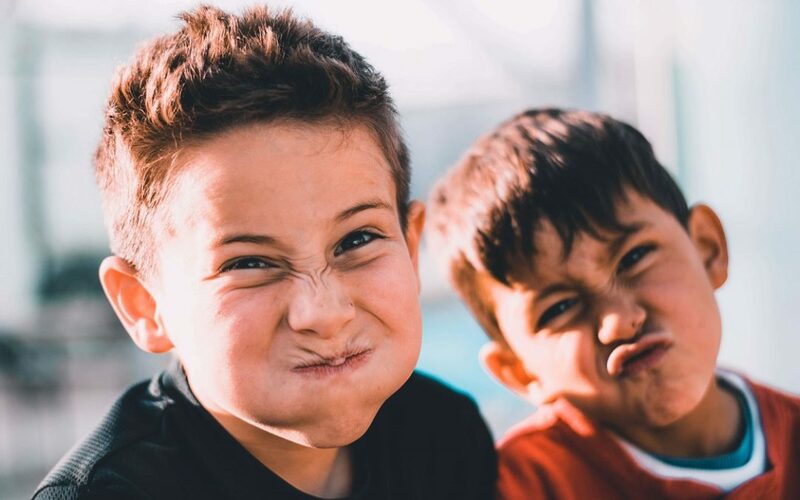 Providing our son with the opportunity to think about these scenarios through play and work through his emotions will be a great asset to him when he is faced with similar situations again at school. Thank you to Jackie Bartell for her insights that sparked the idea for this blog post, and to Maude Le Roux for her suggestions. If you found these suggestions helpful, please consider sharing this post via Facebook or Twitter, and please feel free to offer your own comments, insights, or experiences in the Comments section below. Next time we will explore a few behaviours happening at home and discuss what to do.